Principal Cast : Lon Chaney Jr, Robert Paige, Louise Allbritton, Frank Craven, J Edward Bromberg, Patrick Moriarty, Evelyn Ankers, Adeline De Walt Reynolds, Etta McDaniel, George Irving. Synopsis: Count Alucard finds his way from Budapest to the swamps of the Deep South; his four nemeses are a medical doctor, a university professor, a jilted fiancé and the woman he loves. 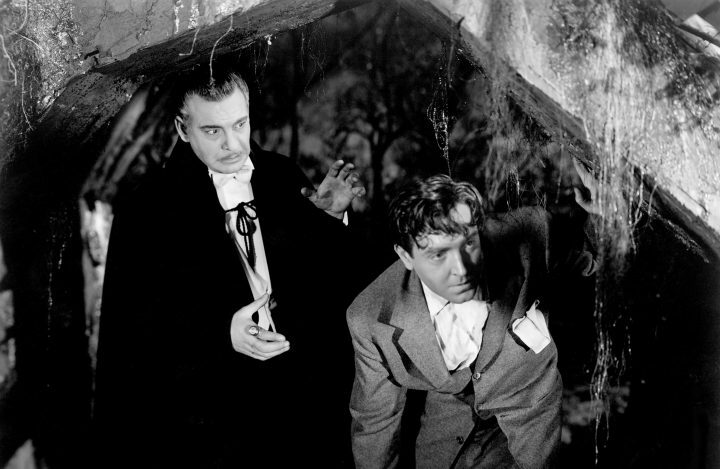 Lon Chaney Jr took over the role made famous by Bela Lugosi in Universal’s original Dracula, for this semi-sequel of sorts, Son Of Dracula, made in 1943. The film’s pretension of cleverness won’t fool anybody, the ruse used by the infamous Count to swindle inhabitants of a rural Florida plantation (complete with generally racist black caricatures) about as clever as a wart on a witches nose, and while the formidable talents of The Spiral Staircase director Robert Siodmak and his team do their best to bring a sense of thrill to the story, in the end it’s all a load of simple hogwash. 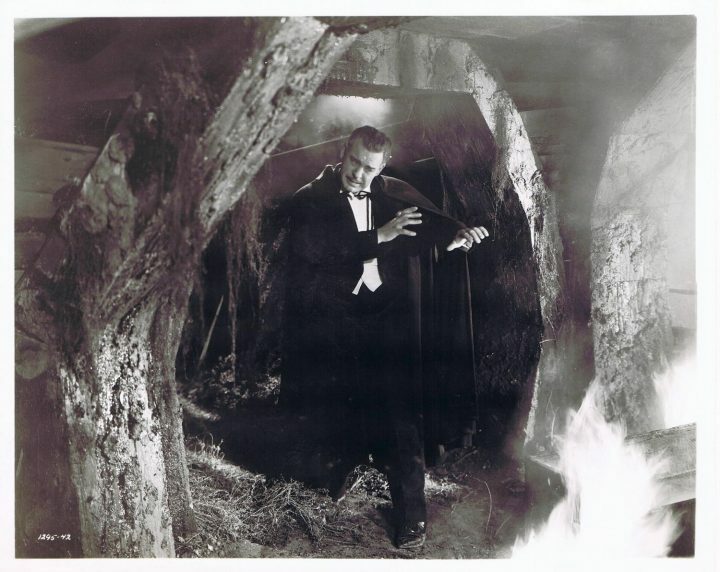 If the film is a success for any specific reason, it’s the introduction to vampire lore of the character’s ability to turn to mist (or smoke) to enter and exit closed rooms, and for the first on-screen depiction of Dracula transforming into his iconic bat figure. The mysterious Count Alucard (Chaney Jr) arrives in America’s deep south, to the Dark Oaks plantation, following an invitation from one of the plantation owner’s daughters, Katherine Caldwell (Louise Allbritton), following a recent trip to Budapest. Katherine’s fiancee, Frank Stanley (Robert Paige) is suspicious of the Count, particularly when Alucard and Katherine secretly wed, and his ensuing madness at the Count’s real identity becomes a mystery to be solved by town doctor Harry Brewster (Frank Craven), who enlists the aid of the visiting Professor Lazlo (J Edward Bromberg), the latter appearing to know a considerable amount about vampire lore and Dracula’s history. The more they uncover about the nightstalking Alucard, the more they have reason to fear an unspeakable evil walks the earth. Okay, so you all guessed that “Alucard” is merely Dracula written in reverse, right? The intelligent characters in this movie do too, and relatively quickly. That’s the kind of ill-fitting cleverness saddling the movie, a movie written by Eric Taylor based off a story by the director’s brother, Curtis Siodmak. The film transplants the Dracula myth out of Eastern Europe, where it is inherently sinister, and into racist old America’s deep south (note, black actress Etta McDaniel, who plays the maid in this film, is the sister of Oscar-winning Gone With The Wind actress Hattie McDaniel, who also… played a maid…) where danger lurks around every weird crypt and the steaming swamp surrounding them. 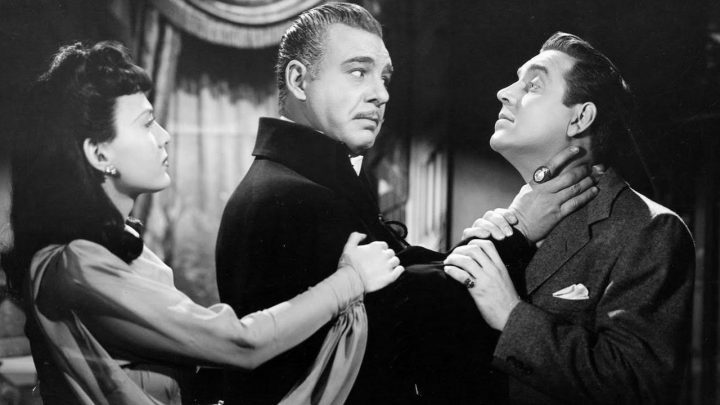 The idea of Dracula moving wholesale to America is pretty logistically idiotic, given the vampire’s predilection for living close to his ancestral home, and Katherine’s motives for essentially seducing the monster for her own purposes is utterly preposterous, even for Hollywood, but to his credit Robert Siodmak makes a good fist of getting this script to work. The film does work well enough only through the work of its cast, particularly Frank Craven’s earnest Dr Brewster, who makes some considerable leaps in logic and plausibility to become the default Mr Exposition of the movie, alongside Bromberg’s hilariously caricature-driven Professor. That a man educated in vampire lore just so happens to arrive in the same vicinity as an actual vampire – not just any vampire, either, the actual Dracula from legend – is never once mentioned, but it soon becomes obvious that the film’s focus on spooky supernatural chills and use of some admirable visual transformative effects is where the true joy lies. Reason and plot logic aren’t a factor here. 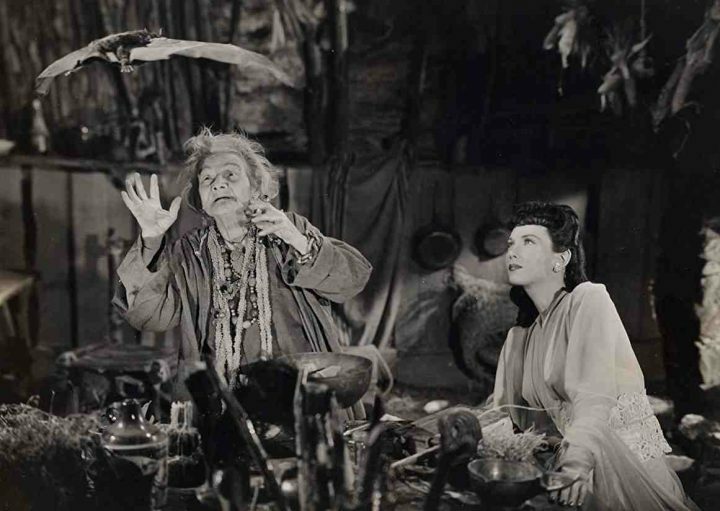 Craven’s performance anchors the film, filling in as a Van Helsing-approximate so as to allow the audience to empathise with him as prime protagonist. Poor Robert Paige’s Frank, the erstwhile fiancee of the glamorous but ice-cool Katherine, is left flailing about in a role designed as the “tragic lover”, spurned and yet still infatuated, motivated by grief and the slow descent into madness. Paige’s work here is suitably overplayed, melodramatic to the hilt, compensating perhaps for the brooding charisma of Chaney Jr. The central female role, played by Luoise Allbritton, seems to be a generic femme fatale, a bewitching beauty who dazzles Dracula so much he just has to up stumps and move continents. Sadly, Allbritton isn’t really up to the part, with the unfortunately thin script dedicated to minimising her depth and making her feels like a silly young woman. Her climactic motivation for the plot, which she breathlessly garbles to an imprisoned Frank at one point, is cheesy and utterly ridiculous and the film cannot salvage much beyond that. Evelyn Ankers plays Katherine’s sister with no impact whatsoever. Lon Chaney Jr tried his entire career to step out of the shadows of his famous father. Among the many roles he took to do so, none is more identifiable to the audiences than that of the bloodsucking Dracula. Chaney Jr oozes subtle menace here, using his imposing stature and dulcet tones to imply violence and death where we never see it. Dressed in the garb of the character’s iconic place in pop-culture, Chaney Jr certainly looks the part, even if he’s no Bela Lugosi. Lugosi at least felt Transylvanian, looked appropriately European to the point of the character, while poor Chaney Jr seems distinctly bland by comparison. Admittedly, his work early in the film is limited, flitting in and out of the story around other characters, whereas in the climactic final act he has to shoulder a lot of the antagonism himself. I don’t think it worked that well, although Siodmak certainly makes the most of what the script has to offer. Son Of Dracula is, if nothing else, very well shot, and hugely atmospheric. 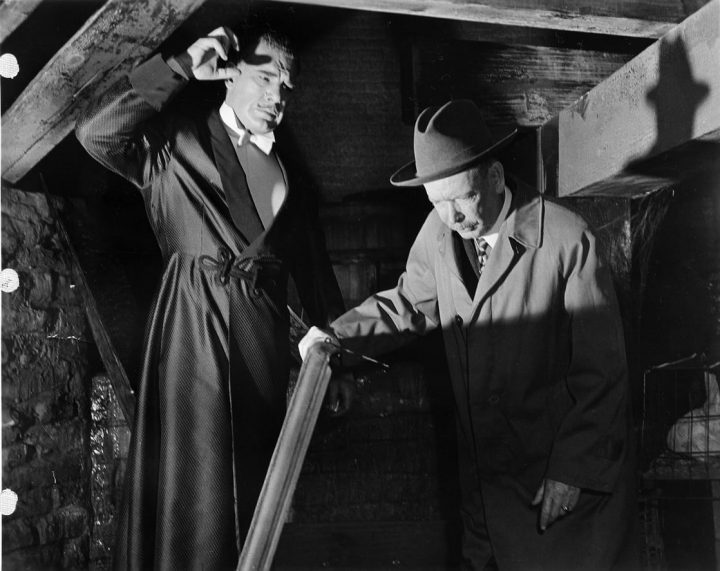 Siodmak’s cinematographer on the film was George Robinson, who had worked on the previous Universal instalment Dracula’s Daughter, for Lambert Hillyer. Robinson’s photography here is suitably creepy, his deft use of shadows, darkness and gloom a perfect visual motif for the Prince of Darkness to enter into. Siodmak’s camerawork and pacing is also on point, with a number of nice little dolly shots giving the feeling of omnipresent evil. 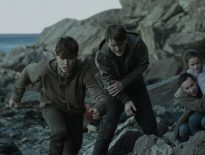 The editing, which is crucial for any good horror film to work well, is really pleasing, the film using a slower pace early on to generate tension through pauses and lengthy sequences of not much action. Musically, however, Hans Salter’s score is entirely unmemorable, even if it is ubiquitously “horror”. For what it’s worth, Son Of Dracula isn’t a very good movie. In terms of what it offers the genre, there’s some new and interesting visual gags that have since become instantly associated with vampire lore, but a half-baked story and Chaney Jr’s decidedly un-charismatic performance as the titular character, as well as a confusing decision to take Dracula to America for no good reason make this one a definite middle-ground story. Son of Dracula is a film desperately wishing it could be as great at its cinematic ancestor, though not for lack of trying by Siodmak. 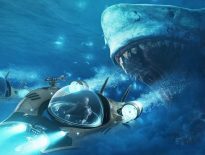 Worth a look, but it can’t touch the legend of the original.